Used for Firearms, Pistols, Handguns, etc. 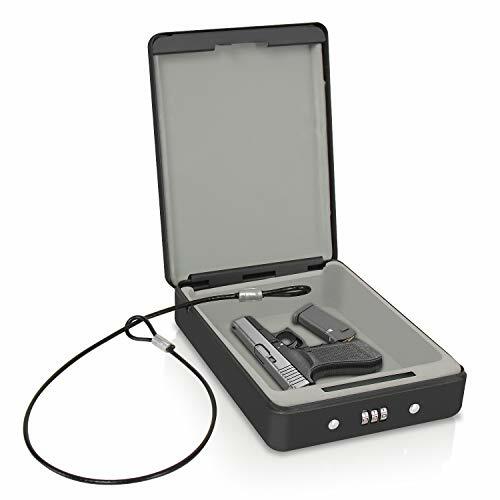 The SereneLife Compact Pistol / Handgun Safe Box - Personal Firearm Combination Lock Steel Vault - Universal Combination Locking Safe Box - Used for Firearms, Pistols, Handguns, etc. - Personal Vault can Also be Used for Storing Cash & Valuables - Rugged & Durable Heavy-Duty Steel Construction - Configurable (3) Digit Combination Access - Key-less Locking Design - Compact & Slim-Style Fold-Open Lid - Pre-Drilled Holes for Wall/Surface Mounting - Simple & Hassle-Free Operation - Safety Tested & Approved - Perfect for Car/Vehicle Glove Compartment & Under Seat Placement - *Optional Anti-Theft Steel Cable Installation - What’s in the Box: - Combination Safe - Anti-Theft Security Cable - Technical Specs: - Security Standard Grade Level: B2.